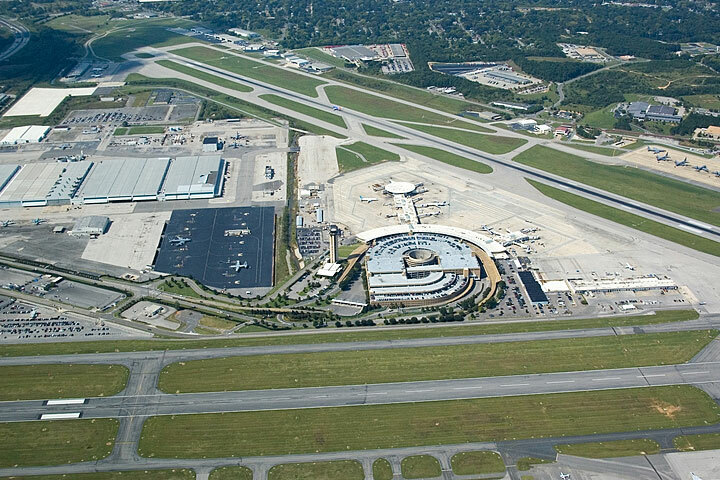 The two international airports in Alabama are the Birmingham-Shuttlesworth International Airport and the Huntsville International Airport. Birmingham's airport serves the Greater Birmingham area and surrounding cities with more than 160 daily arrivals and departures to major cities throughout the USA. Other major Alabama airports include the Dothan Regional Airport, the Mobile Regional Airport, and the Montgomery Regional Airport. 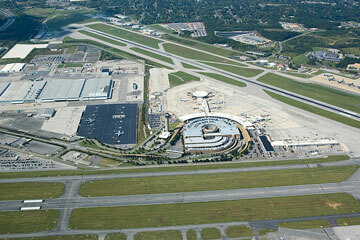 The photo at right is an aerial view of Birmingham International Airport. This Alabama airport map shows FAA-designated commercial service airports, reliever airports, and general aviation airports in the State of Alabama. Primary airports are designated with an airplane symbol. Alabama airport map source: FAA 2001-2005 NPIAS.